When is the last time you said no to an internal request? If you can’t recall, there’s a good chance you’re a tactical order-taker. Being a tactical order-taker is fine if you’re working the drive-through window at a fast food restaurant, but not so good if you’re leading an organization. The dirty secret about being “strategic” within an organization is that you’re going to say no and tick some people off. Get over it. The idea of prioritizing when it comes to internal initiatives and customers brings a shudder to many. “We couldn’t possibly say no,” is the common response. It’s also the response of the mediocre. Great leaders understand that trade-offs involve decisions, and the word decision means “to cut off.” If you have trees on your property, you realize that every few years you must prune, or cut off, some of the low branches? Why? To promote new growth. The key to instilling this level of discipline to focus resources in the few areas that drive the most value for your internal customers is to carve out time to think. The reality is if you don’t give yourself permission and time to think, it simply won’t happen. Leaders unwilling to dedicate time to thinking about the development of their business are prone to fire drills. The fire drill is when people stop purposeful work that is guided by their strategic plan and rush to take care of something urgent that just popped up. If the urgent issue is also important, then naturally it should be taken care of. Unfortunately, many fires are urgent but unimportant. Yet, they still get lots of attention, which wastes valuable time, people, and budget. 1. Coalesce: What are the key insights that will bring new value to my customers? 2. Compete: How will these insights lead to advantage for our organization? 3. Champion: What behaviors do we need to develop to execute our strategy? 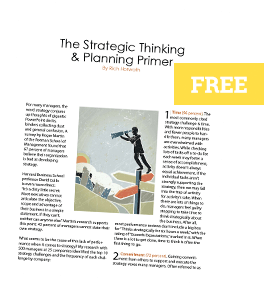 Being a true strategic partner to the rest of the organization requires leaders to make trade-offs, avoid fire drills and generate new insights. Saying yes to every request that comes through isn’t leadership; it’s tactical order-taking. Doing the same things in the same ways as all the other organizations in your industry is the very definition of mediocrity. Excellence requires deviation from the norm. Continually developing unique value should be at the heart of your strategy. What are you and your team doing differently that’s bringing new value to the organization? If you can’t answer that question, then I’ll have a large fry to go.